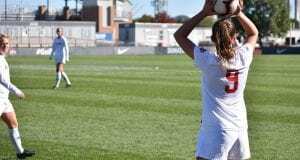 A week of practice that constantly emphasized finishing offensive attacks led to a frenzy of goal-scoring this weekend for the Ohio State women’s soccer team. The Buckeyes hit the road Thursday, first traveling to College Park, Maryland to face off against the 4-9-1 (1-5-0 Big Ten play) Terrapins. 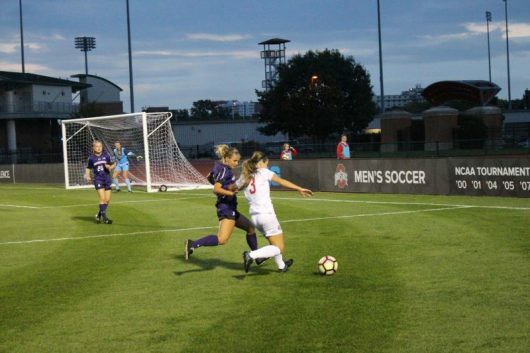 OSU began with a powerful and quick attack, where senior forward Lindsay Agnew scored the first goal in the first minute to propel the Buckeyes to the lead. Less than a minute later, junior midfielder Emma Firenze netted her first goal of the season, doubling the Buckeyes’ lead to 2-0. OSU entered the second half versus Maryland having nine shots against 5. Agnew created multiple scoring opportunities, including two crosses connecting with junior forward Sammy Edwards, both resulting in goals. This put the Buckeyes up 4-0 after 58 minutes. The Buckeye defense held strong, closing the game with a shutout over Maryland, earning the team’s eighth win on the season. 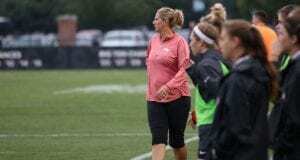 Sunday, OSU made its way to West Lafayette, Indiana, to play the 3-10-1 (1-6-0 Big Ten play) Purdue Boilermakers. 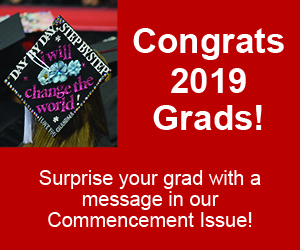 Quick goal-scoring was a common theme on the weekend, as the Buckeyes had a fiery start again versus the Boilermakers, with a goal in the eighth minute by Edwards. 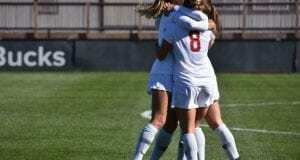 This marked her third goal within the two weekend matches. Near the end of the first half, senior midfielder Nicole Miyashiro assisted a goal by redshirt senior forward Morgan Wolcott to put the Buckeyes up 2-0. OSU’s shots doubled that of Purdue’s at the end of the first half, with 10 shots to five. In the 52nd minute, OSU senior forward Nichelle Prince was fed a ball through Purdue’s defense to face off 1-on-1 with the goalkeeper, ultimately resulting in a score for the Olympian. 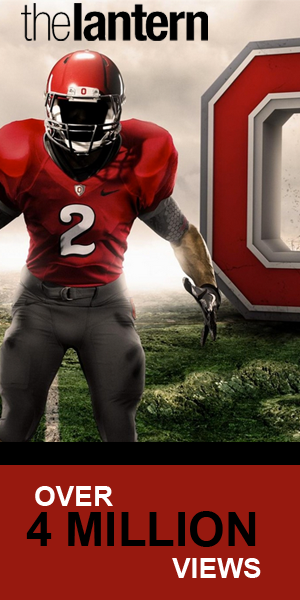 This upped the Buckeye’s lead to 3-0. Two minutes later in the 54th, Prince’s shot again found the back of the net, making it a 4-0 lead. Strong defense continued throughout the game, but ultimately could not be perfect, as Purdue senior midfielder Milaro Gianna snapped the shutout, scoring Purdue’s only goal of the day. OSU prevailed with a 4-1 victory in the end. 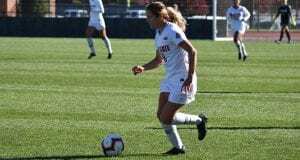 The Buckeyes improved to 9-4-2 on the season (3-2-2 Big Ten play), recording a total of eight goals in two games while maintaining strong defensive play, only conceding one goal. 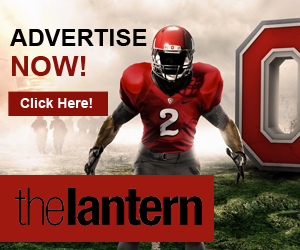 OSU’s next game is against the Indiana Hoosiers at Jesse Owens Memorial Stadium at 7 p.m. Thursday.